Puntung’s initial abscess had a more serious origin, and this photo before she was euthanised shows how large the carcinoma had become. KOTA KINABALU: Sabah has lost Puntung, the Sumatran Rhino who touched the hearts of many. Sabah Wildlife Department Director Augustine Tuuga said Puntung was euthanised this morning at Tabin Wildlife Reserve. A week ago, Augustine broke the news that Puntung could no longer breathe through her left nostril and was no longer able to vocalise, was in pain and her condition was declining fast due to squamous cell cancer. Puntung had been suffering since mid-March from an abscess inside her upper jaw that would not heal despite treatment. 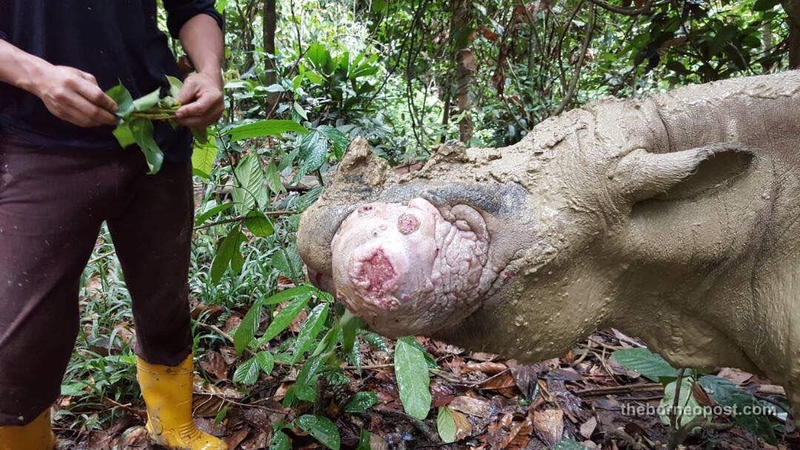 Initially captured on Dec 18, 2011, the rhino attracted global attention in April 2017 through dental surgery performed by a multi-national team in the Tabin Wildlife Reserve. She was one of the last three Sumatran rhinos in the country; now, they are only two left. Augustine in a statement issued to the media said that Puntung’s keepers Wilson Kuntil, Hassan Sani and Samad Gubin had been sleeping for the past week with Puntung in her forest paddock, to ensure that she was under 24-hour observation. They were very attuned to subtle changes in her behaviour and reported periodic bleeding from the nostrils, he said. “The carcinoma had been growing rapidly in size and there were clear signs that Puntung was experiencing significant breathing difficulties. In consultation with our rhino reproduction advisers at Leibniz Institute for Zoo and Wildlife Research in Berlin, and others, the decision was taken to end her growing discomfort, and bring forward the planned date of the procedure. “Previously, we planned to euthanise her on June 15. In pursuit of the aim to allow Puntung to contribute to the survival of her species, her ovaries were rushed to the Agro-Biotechnology Institute, Serdang,” added Augustine. Simultaneously, Indonesian reproductive specialist Professor Arief Boediono was flown in from Jakarta, ready to recover any egg cells that might be present. will be thawed for intracytoplasmic sperm injection by Professor Arief. We will know the outcome within a few days,” Augustine said. In addition, tissue samples from Puntung are being provided to Malaysian institutions so that her genome can be preserved through cell cultures. Other keepers who have attended to Puntung in recent months are Rasaman Jaya, Marikus Suyat, Justine Sagunting, Joseph Stimon, Ronald Jummy, Davidson Kuntil and Alvin Erut, with Dr Zainal Zahari Zainuddin in charge.